In the early 1970s, musical pioneer Chuck Brown began laying the foundation for a new and innovative sound in Washington, D.C., called go-go music. Driven by teenage musicians and audience members, the music was heavily inspired by funk, blues, soul, and salsa. It's most identifiable by its syncopated polyrhythms and the use of multiple percussion instruments. Initially, "go-go" was the term used to identify the place where young people were partying. In time, the funky, homespun music became known as go-go music. 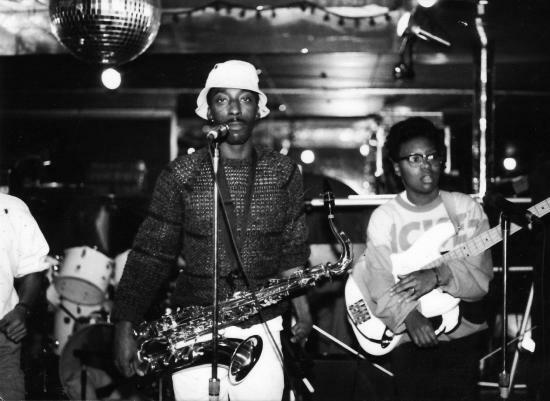 Little Benny and the Masters (Rory "DC" Felton on saxophone and MeShell Ndegeocello on bass) at the Metro Club, 1986. Photograph by Thomas Sayers Ellis, used with permission. Calling it go-go music in the early years made perfect sense because, between songs, the percussion section would continue to play while the band leader would engage the audience through melodic call and response sessions. This call and response method of engaging audiences became wildly popular as birthdays were recognized, graduations were celebrated, and the neighborhoods in attendance were recognized openly over the music. Because the beat never stopped, Chuck Brown concerts were essentially marathon performances that kept his fans on the dance floor for hours. Brown described coming up with the idea of eliminating song breaks as a way to compete with disco DJs who enjoyed celebrity status among local partygoers. Go-go fans at Robert F. Kennedy Memorial Stadium in Washington, D.C. Photograph by Thomas Sayers Ellis, used with permission. The popularity of the new sound spread quickly and resulted in a fierce competition between local D.C. bands. In fact, there were dozens of go-go bands that popped up here in Washington, D.C., in the mid-1980s. A typical go-go band had keyboard players, horn sections, string sections, multiple percussionists, and many were teenagers. Where did the formal music training come from, you ask? In the late 1970s and early 1980s, there were strong music programs in D.C. high schools across the city, with heated rivalries between the school marching bands. Many of these marching band members used the skills learned in the school classrooms to become professional performers on the local go-go circuit. Portrait of Mayor Barry. Scurlock Studio Records, ca. 1905-1994, Archives Center, National Museum of American History. The supply of well-trained musicians wasn't the only way that go-go music received a boost from the city's public institutions. 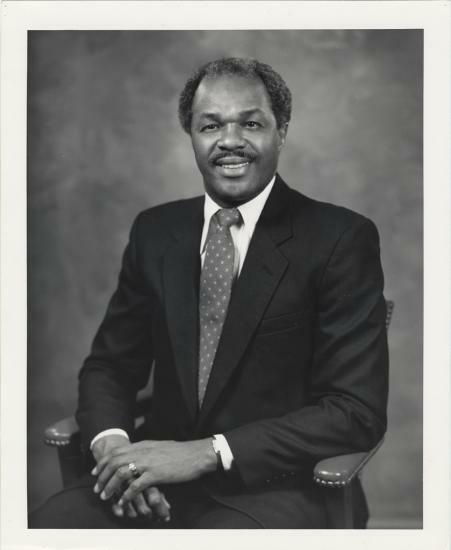 During Marion Barry's first term as mayor, there was an animation of D.C.'s cultural atmosphere, a surge in black pride, and a focus on providing jobs and resources for city residents. Mayor Barry's Summer Youth Employment program made it possible for young people to gain work experience and income—and many brought musical instruments. 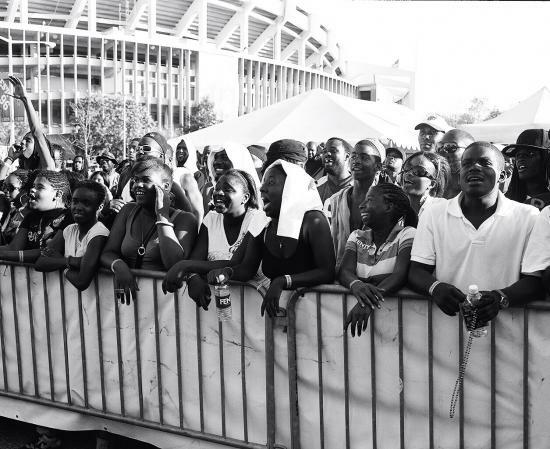 During our notoriously humid summer months, the D.C. Department of Parks and Recreation used its Showmobiles (essentially portable stages), to provide free go-go concerts for the city's young people. The bands were re-creating and covering many Top 40 hits of the day, adding the D.C. go-go percussive rhythms. One of the bands that received a stipend from the city to perform on the Showmobiles recalls performing up to four concerts a day during one particular summer in the 1980s! 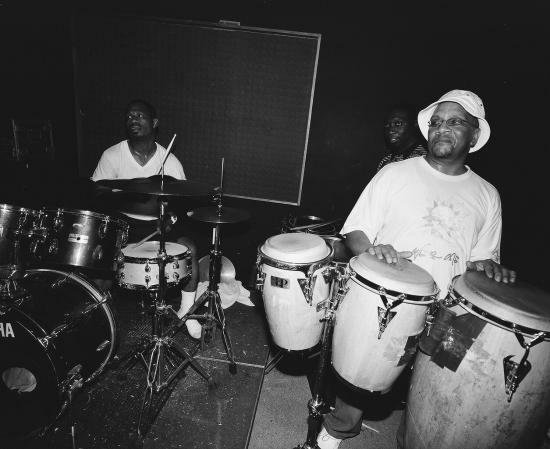 Go-go musicians practice drums and congas. As musicians sometimes say, "practice makes pocket," meaning that percussion creates a rhythmic center for the music. Photograph from 2010 by Thomas Sayers Ellis, used with permission. With go-go music's local reach expanding rapidly, several venues around town that formerly catered to disco, funk, and blues, decided to open their doors to these new bands. Several of the most popular venues included the Panorama Room (in Anacostia, in the southeastern area of the city), the Masonic Temple (on U Street NW), the Coliseum (in Northeast), the Howard Theatre, RSVP, and several more across the city. While many of these venues are no longer around, they are common elements in the history of the music. 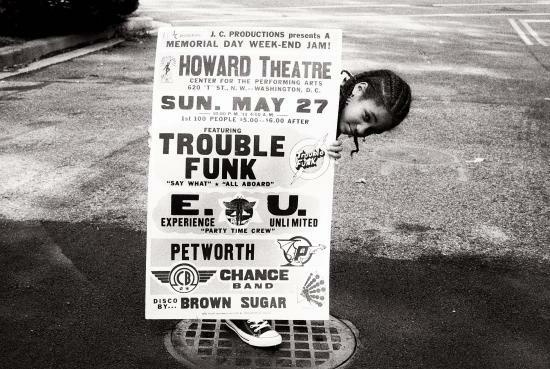 A child holds a billboard for Memorial Day shows at the Howard Theatre, featuring Trouble Funk and Experience Unlimited. Photograph by Thomas Sayers Ellis, used with permission. While the invention of go-go music is well-storied in the Washington, D.C., community, it has been largely overlooked by cultural historians outside of our nation's capital. Unfortunately, commercial success hasn't found its way into the historical narrative, other than Chuck Brown's 1978 signature hit "Bustin' Loose" and the use of a song by Experience Unlimited in the soundtrack of Spike Lee's movie School Daze. It is interesting to note that even without tremendous commercial success, go-go music has thrived as a local industry. During the 1980s and 1990s, cassette tape recordings of live shows were sold by vendors and bands all over the city, functioning as a vibrant, secondary market for the music. The most notable bands were undoubtedly Chuck Brown and the Soul Searchers, Rare Essence, Trouble Funk, Junkyard Band, and Experience Unlimited. Through strategic and savvy management practices, these bands enjoyed decades of success and helped the music to remain relevant over the years. 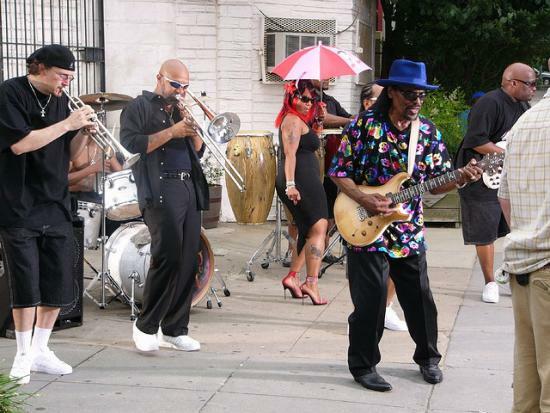 Photo from a Chuck Brown music video shoot. By Flickr user Dale Sundstrum, via the Creative Commons. Much like the birth of hip-hop in the Bronx during the same period (featured in the Places of Invention exhibition, opening July 1 in the Lemelson Center for the Study of Invention and Innovation), this new music was developed within a community that was experiencing significant economic hardships. During the 1980s, Washington, D.C., was described as a city with two population groups—the visible and the invisible. The visible group consisted of tourists, the Washington elite, the federal government, and professionals who flowed in and out of the city. The invisible group was the largely African American, blue collar group that made up a fairly high percentage of the city's population. The music flourished because, much like blues and soul, it encapsulated the full range of experiences in these communities and brought joy as an inexpensive, fun, social expression. For most, the history of go-go music is synonymous with the history of the people that created it and gave it life. From the time of its inception, go-go music has existed as a raw, cultural asset that is owned equally by all of its D.C. fans. If you listen carefully, within the raw percussion and the funky grooves, you'll hear the heartbeat and humanity of a very proud D.C. community. Is there a type of music that is unique to your hometown? What combination of people, resources, and landscape resulted in a musical innovation where you live? Share your community as a "place of invention" on our interactive map. Editor's Note: This blog first appeared on the National Museum of American History's O Say Can You See? It was co-written with James K. Zimmerman, Senior Public Programs Producer for the National Museum of American History’s Office of Programs and Strategic Initiatives, and a native Washingtonian.